What? Two posts in one day? Yup yup - I'm on a roll. :-) I have had some time to sit at the computer and do nothing so I thought I would catch up on some challenges and blog posts. I might get one more follower. Ha! Stamp and Create has a monthly challenge. The challenge for June is: Bold and Bright. I can do that. I thought this project would be perfect because it is not only bold and bright, it is also cheery! I seriously enjoy making these notebooks. It is a bit time comsuming even though it is very easy. I have the Cinch. I bought mine on sale at Hobby Lobby but they also have it at Joann's, Michael's and AC Moore. I'm sure they have it at any local craft store. It is so simple. You know how every year, on your child's supply list, they have composition books. Then, when the end of the year comes they send home those same composition books with only 5 pages written in them. I am positive the teacher has good intentions when starting these books. They have these ideals of the perfect journal. I know. I am a teacher. Unfortunately, things happen and you get a composition book with only five pages written in it. Of course you can't rip those pages out and reuse it the next year because of how it is it bound. Once you rip pages out it ruins the integrity of the binding. I take those composition books with those perfectly new pages and make these notebooks. I break up the binding and cut the pages all the same size. You definitely need a big paper slicer, otherwise it will take forever. I use the front and back cover of the same composition book and cover it with DP. In this case I used paper from DCWV Blossoms and Butterflies Stack. I should've taken a pic of the notebook opened up. I forgot - sorry. I used ribbon scraps on the binding. (Don't throw away those scraps! They are good for small things like this!) I will post a pic one day of how I store my scraps. I have a ribbon obsession. 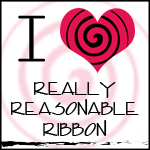 I have lots and lots of ribbon. How many of you out there are the same way? Ha! Obviously this was for my friend, Amy. The letters are SU Defining Alphabet. The half pearls around the name is from Queen & Co. (grass green) that I got from AC Moore. The stamp, Wags and Whiskers Angel Whispers, was embossed on watercolor paper and colored with Twinkling H2Os. I don't know if you can notice the dog. I covered the dog in white fun flock. It's pretty cool in real life. Fuzzy. In the girl's hair is another half pearl in Orchid from Queen & Co.